Fox News is reporting today that emails obtained by Citizens United as part of its ongoing Freedom of Information Act request to the State Department show collusion between Hillary Clinton and the Democrats of the Senate Committee that was investigating Benghazi. So Senator Menendez was not interested in finding out what actually happened at Behghazi–he was interested in advancing Hillary’s political ambitions. I know there were people on that committee that cared about the truth, but they were blocked by committee members that were playing politics. Fox News asked the Clinton campaign as well as Menendez’s office if they coordinated before the 2013 Senate Foreign Relations Committee hearing; what was meant by the term “wired;” and how the email exchange was consistent with the principle of independent congressional oversight. There was no immediate response from either. In 2013, the New Jersey senator — who is now facing federal public corruption charges — at the time of the hearing was about to become chairman of the Senate Foreign Relations Committee, replacing John Kerry who was in line to replace Hillary Clinton as secretary of state. Menendez has denied any wrongdoing. Washington no longer represents the interests of Americans. It is time to clean house. I think we need to listen to this lady. How could anyone vote for Hillary after hearing this? The Washington Examiner is reporting today that Democrats on the House Select Committee on Benghazi voted against releasing the findings of the committee. Sections of witness testimony and internal documents remain classified, although committee Chairman Trey Gowdy has pushed the White House to clear as much information as possible for release. As Americans, we are entitled to see the results of this investigation without any filters. We should be smart enough to read it and draw our own conclusions. It’s time to end secrecy in Washington. Yesterday The Daily Caller posted an article about statements made by Hillary Clinton regarding the attack on Benghazi. The article reports that Mrs. Clinton is denying that she told the family members of those killed in Benghazi that the attack was the result of a video. This is the video of Mrs. Clinton speaking when the bodies of those killed in Benghazi were returned home. I am embedding it in case it disappears from the internet. At marker 8:50 in the video, Mrs. Clinton states that the violence against American embassies was the result of an internet video. I have no way of knowing exactly what Mrs. Clinton said to the families, but her statement on the video certainly illustrates the talking point of the day. During an editorial board meeting with The Conway (N.H.) Daily Sun, Clinton was asked about an interview she recently had with ABC News’ George Stephanopoulos in which she denied that she told family members of the Benghazi victims during a Sept. 14, 2012 memorial service at Andrews Air Force Base that the film “Innocence of Muslims” was the catalyst for the attack. “I was in a very difficult position because we have not yet said two of the four dead were CIA…This was a part of the fog of war,” she added. During her Dec. 6 interview with Stephanopoulos, Clinton specifically denied that she spoke to the families about the video or the filmmaker. She also said that she “can’t help it” that the Benghazi victims’ families believe that she fingered the video during their private conversations. “I understand the continuing grief at the loss that parents experienced with the loss of these four brave Americans. And I did testify, as you know, for 11 hours. And I answered all of these questions,” Clinton added. “Now, I can’t — I can’t help it that people think there has to be something else there. The one thing I will say is that Mrs. Clinton does not have the political skills of her husband. On Friday, Breitbart.com posted an article about the actions of the FBI regarding the home of the killers in San Bernardino. The actions taken by the FBI were inappropriate; and unfortunately, fit a pattern of conduct that is not constructive. The shocking sight of journalists storming into the apartment of the San Bernardino terrorists, less than 48 hours after the attack, was apparently allowed by the FBI, which handed the apartment back over to the landlord, who let the media in with a crowbar. How much information will be lost to the investigation because the FBI was so quick to leave the place where pipe bombs were being built and ammunition was being stockpiled? How many sets of fingerprints will never be investigated? Unfortunately this is not a unique situation for President Obama’s FBI. For example, the government has done almost nothing with the treasure trove of intelligence information it recovered during the raid on Osama bin Laden’s compound in May 2011. Stephen F. Hayes of the Weekly Standard has waged a lonely battle to force the government to take the intelligence seriously–intelligence that could disrupt terror networks and prevent future attacks around the world. “They haven’t done anything close to a full exploitation,” perhaps only 10%, he quoted one analyst in May 2015. Somehow I am convinced that this is not the way CSI would have done it. The video below was posted on YouTube yesterday. The thing that caught my attention was the reaction of the newscaster to Mrs. Smith’s comment about not being an immediate family member. Whether or not she is an immediate family member could actually be discussed, but courtesy says that because she has acted like an immediate family member (and is a close family member), she could easily be treated as one. A little compassion on the part of Mrs. Clinton is in order here. Yesterday The Daily Caller reported that the State Department gave the House Select Committee on Benghazi 1,300 pages of new emails from Ambassador Chris Stevens. There have been seven Congressional committees that have investigated the attack in Benghazi, and this is the first time the State Department has turned over these emails. I don’t know if this sort of behavior is typical of the State Department, but it is definitely typical of the Obama Administration. We saw the same thing with the investigation into the politicalization of the Internal Revenue Service–stall, stall, and stall some more, and then claim that the investigation is dragging on because it is political or that the investigation is old news. Unfortunately I believe that Hillary Clinton will walk away from her day in Congress unscathed. I believe that there is a reason she insisted on a public hearing. She is going to say that the investigation is political and cite as her proof the fact that thus far there is no smoking gun. Somehow the fact that the information needed to do the investigation has been withheld from the Committee will be overlooked. Gowdy (South Carolina U.S. Rep. Trey Gowdy, who chairs the Select Committee) gave a different characterization of the emails during his interview on Sunday, however. He said that Stevens’ communiques show that he began requesting additional security in June 2012, when he was appointed ambassador. Instead of receiving help, though, Gowdy said that State Department officials asked Stevens to help craft “public messaging advice” on the precarious situation in the north African country. Gowdy said that other emails show that one of Clinton’s top aides, Jake Sullivan, asked Stevens to vet an intelligence report written by Clinton’s longtime friend, Sidney Blumenthal. It is up to the voters to hold their elected officials accountable. The behavior of Hillary Clinton in regard to Benghazi is unacceptable. Remember–the only person to serve jail time for the attack on Benghazi was the person who made a video that had nothing to do with the attack and the Obama Administration lied about the role of the video in the attack. Yesterday CNN posted the transcript of an interview of former Secretary of State Hillary Clinton by Brianna Keilar, CNN’s Senior White House Correspondent. KEILAR: One of the issues that has eroded some trust that we’ve seen is the issue of your email practices while you were secretary of state. I think there’s a lot of people who don’t understand what your thought process was on that. CLINTON: Well, let’s start from the beginning. Everything I did was permitted. There was no law. There was no regulation. There was nothing that did not give me the full authority to decide how I was going to communicate. Previous secretaries of state have said they did the same thing. And people across the government knew that I used one device – maybe it was because I am not the most technically capable person and wanted to make it as easy as possible. KEILAR: – subpoena deleted emails from them? CLINTON: You know, you’re starting with so many assumptions that are – I’ve never had a subpoena. There is – again, let’s take a deep breath here. Everything I did was permitted by law and regulation. I had one device. When I mailed anybody in the government, it would go into the government system. Now I didn’t have to turn over anything. I chose to turn over 55,000 pages because I wanted to go above and beyond what was expected of me because I knew the vast majority of everything that was official already was in the State Department system. And now I think it’s kind of fun. People get a real-time behind-the-scenes look at what I was emailing about and what I was communicating about. CLINTON: – yes, a secure fax machine, which is harder to work than the regular. So yes, this is being blown up with no basis in law or in fact. That’s fine. I get it. This is being, in effect, used by the Republicans in the Congress, OK. But I want people to understand what the truth is. And the truth is everything I did was permitted and I went above and beyond what anybody could have expected in making sure that if the State Department didn’t capture something, I made a real effort to get it to them. And I had no obligation to do any of that. So let’s set the record straight. And those 55,000 pages, they will be released over the course of this year. People can, again, make their own judgments. I know you say you were permitted. I just am trying to understand some of the thought process behind it. One former state attorney general, a Democrat, told CNN that they know of no lawyer who would advise someone, a client, facing the kind of scrutiny that you’ve been facing to wipe their server. I added the underlines and italics. That (Hillary Clinton’s statement that she had never had a subpoena) drew a rebuke from Trey Gowdy, the GOP chairman of the House Select Committee on Benghazi, who said the need to “correct the inaccuracy” led him to break with his practice of not releasing subpoenas the panel has issued. “The committee immediately subpoenaed Clinton personally after learning the full extent of her unusual email arrangement with herself, and would have done so earlier if the State Department or Clinton had been forthcoming that State did not maintain custody of her records and only Secretary Clinton herself had her records when Congress first requested them,” Gowdy said in a statement. 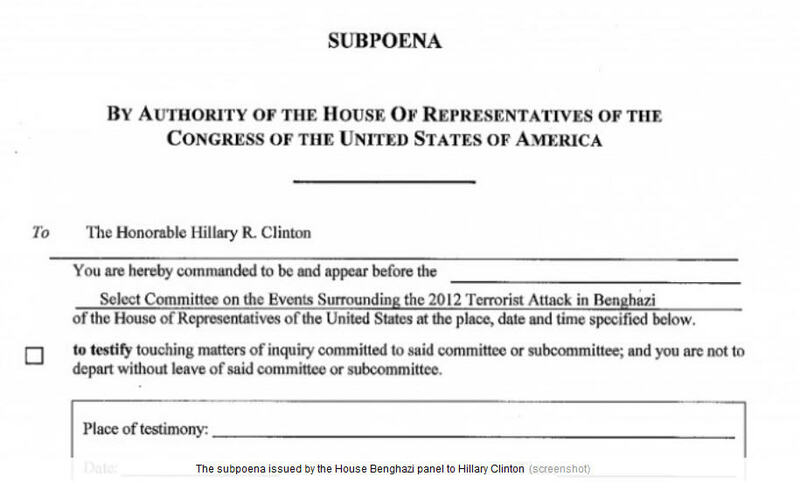 The subpoena sought Clinton’s messages from 2011 and 2012 related to Libya and the 2012 attack on a diplomatic compound and CIA facility in Benghazi that killed four Americans. Very few people have honorable reasons for wiping a computer hard disk clean–particularly after they have been subpoenaed. Why does this matter? Other than the disregard for the Federal Records Act, it means that we will never have an accurate record of Hillary Clinton’s tenure as Secretary of State. The record we do have will have omissions and changes, and we will have no way of knowing what is missing or what is edited. Evidently Mrs. Clinton did not feel that the law applied to her. The Republicans control the House of Representatives and the Senate. Therefore,it should be easy to investigate what happened at Benghazi, despite the fact that the Democrats involved are experts at stonewalling. Well, new information that has come to light indicates that part of the problem with the investigation may be that there are also Republicans involved that would like to keep the details of what happened at Benghazi secret. On Thursday, The Daily Caller posted an article about some new information that has come out as a result of the emails that are finally getting released. “Rogers” is then-House Intelligence Committee Chairman Mike Rogers, a Republican. The email was unearthed at the deep end of the document dump and first noted in a piece by Catherine Herridge and Pamela Browne of Fox News. The story goes on to detail the connection between Representative Rogers and his wife and Benghazi. In 2014, Representative Rogers abruptly resigned from the House of Representative. About the same time his wife left an executive position at Aegis Defense Services, a private defense contractor. This may be totally coincidental, but it illustrates one thing–America has developed a political class that sometimes puts its personal interests ahead of the interests of our country. That is a major problem in our government right now. Please follow the link above to The Daily Caller to read the entire story. This story is one more example of why term limits are a good idea. There seems to be something in the water in Washington that makes people compromise the principles they claimed to have before they got there. Maybe if we limit their terms of office, the effect of the water will be minimal. We owe a debt to Representative Trey Gowdy for continuing this investigation despite opposition from his own party. The Wall Street Journal posted an article today about the latest batch of Hillary Clinton’s emails released by the State Department. While there is no ‘smoking gun’ in the emails as such, the emails reveal a State Department that was not run according to the usual chain of command. In the pre-Memorial Day weekend news dump, long-time Clinton plumber Sidney Blumenthal plays Maxwell Smart, passing along intel on Benghazi from half a world away. Secret Agent Blumenthal apparently derived this wisdom from his new business associates who were attempting to win contracts from Libyan nationals. Mrs. Clinton often circulates the memos among her top diplomats with comments like “useful insight” and “very interesting,” and they would often then push them down the chain of command, without identifying the source. Mrs. Clinton was the Secretary of State, for heaven’s sake, one of the five most powerful national security positions in the U.S. government. She had the entire State Department intelligence division at her disposal, known as the Bureau of Intelligence and Research or INR, and presumably had access to the 16 other U.S. agencies that make up the intelligence community. Yet she’s consuming and taking seriously information from an “analyst” who knows nothing about the subject. Mr. Blumenthal’s expertise is in political wet work and monetizing his connections to the Clintons. The imprimatur that Mrs. Clinton’s office put on Mr. Blumenthal’s outside improv offered him a way to influence policy even after the Obama White House had barred Mrs. Clinton from formally hiring him. It is becoming very obvious that Mrs. Clinton ignored the advice of the White House and played by her own rules. It is also interesting that the emails the State Department released had certain items redacted that were not redacted in the emails that the New York Times obtained. It is interesting to see what the State Department chose to redact. I strongly suggest following the link above to read the entire article in the Wall Street Journal. It is obvious to me (and I suspect to any thinking person) that the Clinton emails had been well scrubbed before they were released. It is also obvious that they were released just before Memorial Day when the American public would be least likely to pay attention to them. This is typical of the past behavior of the Clintons and could be expected to be typical of any future behavior should Mrs. Clinton be successful in her bid for the presidency. The larger question isn’t Mr. Blumenthal’s faux life of danger. It’s why a potential Commander in Chief invested so much trust in such a figure. The Southern Gothic novel that is Clinton family political history—with its melodrama, betrayals and paranoia—has left them dependent on insular loyalists like Mr. Blumenthal whose opinions are never second-guessed. Voters should know they’d not only be electing Hillary, and Bill, and Chelsea, but this entire menagerie. Yesterday John Hinderaker at Power Line posted a story about new information about the Benghazi attack in 2012. The new information is the result of a Freedom of Information Act (FOIA) request by Judicial Watch asking for documents related to Benghazi. The Judicial Watch FOIA request was submitted years ago, but the Obama Administration had not produced the requested documents. In September of last year, a federal court ordered the State Department and the Defense Department to produce certain documents. The documents are slowly being produced. They are heavily redacted, but Judicial Watch has received them. Why are we still talking about Benghazi almost three years later–because the Obama Administration has consistently blocked any investigation into the events surrounding the attack. The article includes some of the documents Judicial Watch has received, and I would strongly suggest following the above link to the article and reading those documents. …The attack on the American consulate in Benghazi was planned and executed by the Brigades of the Captive Omar Abdul Rahman (BOAR). [Ed. : Rahman is the Blind Sheikh.] BCOAR is also responsible for past attacks on the Red Cross in Benghazi and the attack on the British ambassador, they have approximately 120 members. …Weapons from the former Libya military stockpiles were shipped from the port of Benghazi, Libya to the Port of Banias and the Port of Borj Islam, Syria. The weapons shipped during late-August 2012 were Sniper rifles, RPG’s, and 125 mm and 155mm howitzers missiles. I think there are still some questions that need to be answered. Yesterday Commentary Magazine posted an article entitled, “Clinton’s Parallel Government and Obama’s Great Miscalculation.” The article deals with some of the implications of the recent revelation regarding Hillary Clinton as Secretary of State using a private email account and her own private server. This is not normally the way government business is conducted. There are a few interesting things here. How many investigations into the Benghazi attack failed to note the private email account? If the investigations missed that, what else did they miss? 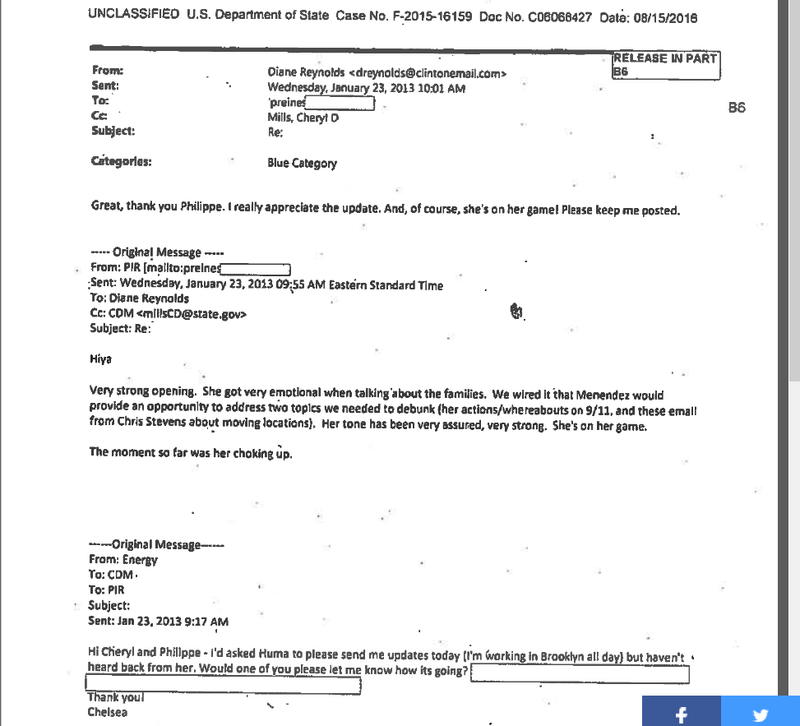 How many people in the Obama Administration received emails relating to government business from this private email account and failed to notice that it did not come from a government email account? Was this noted? Did anyone care? …Sometimes the Clintons’ parallel government works in Obama’s favor, such as Clinton’s Benghazi disaster. Her independent email server and private addresses enabled her to hide her correspondence on the attack, which also shielded the rest of the administration from that scrutiny. Obama is infamously secretive about his own records and his administration’s unprecedented lack of transparency was a good match for the Clintons. But it also meant a certain degree of this went beyond his control. Hillary’s family foundation, which essentially became a super-PAC for foreign governments, was supposed to have donations vetted. They didn’t. They were supposed to have Bill Clinton’s paid events cleared. And they did–they were cleared by Hillary’s State Department. They weren’t supposed to accept foreign-government money while Hillary was secretary of state. They did. Clintonworld operated as a distinct, independent entity for its own purposes while also running American foreign policy. The phrase “conflict of interest” does not even begin to approach the disturbing ethical calculations here. But it can’t be argued that Obama didn’t know what he was getting the country into. He just thought he could control it. He was wrong, and he was wrong to try. And we’re only beginning to see the consequences. This could get interesting. There is, after all, no honor among thieves.